For the past few months I’ve been mentoring a group of photographers from the Redeye Network. 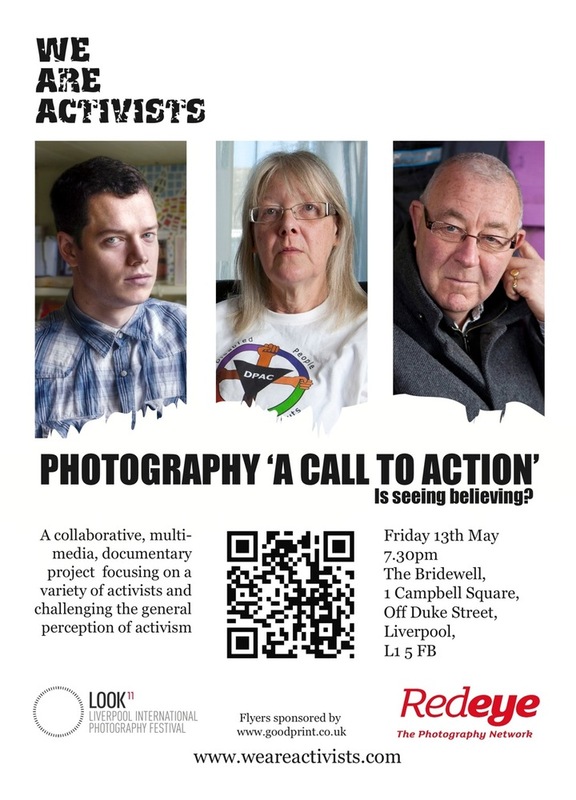 They are mainly based in the Manchester/Liverpool area and we have met a handful of times both online and off in the run up to the exhibition mentioned in the flier above. 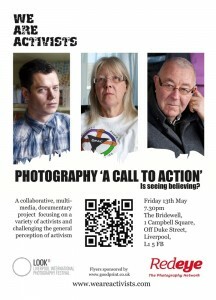 If you are around Liverpool on Friday the 13th of May why not pop over to The Bridewell (a former prison) and attend the launch of the new exhibition. (There may be free wine). I’m really impressed with what the group have achieved and the steep learning curve they have navigated while dabbling in new mediums and learning new tools. I’d introduce the photographers/artists involved but I think it would be best if they drop a comment below and introduce themselves..
Hi. My name is Giuseppe Lambertino and I’m part of the collaborative WAA project. I personally tried to focus on local grassroots activists involved with issues that don’t often get an airing or deemed important enough. It’s been a great experience to work with different people, expand my network and learn more about the fields of activism that folk are interested in. Thanks to everyone involved, the team, the activists, the mentor and Redeye Network for the opportunity. I’m Tony Byrne, a photographer focussing on documentary and portraiture. I decided to apply to work with Christian because of the energy and enthusiasm he showed when he gave us a presentation and because I was interested in seeing how social media could be utilised on a photography project. I have an IT background but it was always just a job. The We Are Activists project has been great because I’ve been working with WordPress, video and audio and it’s been fun. I also picked up some useful skills. I was pretty sceptical about social media – I was already an infrequent user of Facebook but since working on this project have started having a dabble with Twitter. I’m still using my £15 Nokia on PAYG but I’m thinking about an iPhone purchase. I plan to start blogging and am also looking at learning Dreamweaver now.I met people from the Glasgow Media Group, Amnesty International and Disabled People Against Cuts (DPAC). I photographed and interviewed them at home and work. I wanted to portray something of their day to day lives.